The future of the world's forests is at the forefront of environmental debate. Rising concerns over the effects of deforestation and climate change are highlighting the need to conserve and manage existing forests and woodland through sustainable forestry practices. The Forests Handbook, written by an international team of both scientists and practitioners, presents an integrated approach to forests and forestry, applying our present understanding of forest science to management practices, as a basis for achieving sustainability. Volume One presents an overview of the world's forests; their locations and what they are like, the science of how they operate as complex ecosystems and how they interact with their environment. Volume Two applies this science to reality. It focuses on forestry interventions and their impact, the principles governing protection and on how we can better harness the enormous benefits forests offer. Case studies are drawn from several different countries and are used to illustrate the key points. Development specialists, forest managers and those involved with land and land-use will find this handbook a valuable and comprehensive overview of forest science and forestry practice. Researchers and students of biology, ecology and geography as well as forestry will find it equally accessible and useful. Julian Evans is professor of Tropical Forestry at the Imperial College of Science, Technology and Medicine, University of London and also holds an Honorary Chair at the University of Wales, Bangor, UK. He was formerly Chief Research Officer of the British Forestry Commission and is a Fellow of the Institute of Chartered Foresters. He is author of over 100 scientific papers and seven technical books on temperate and tropical forestry. Julian is a vice-chair of the Commonwealth Forestry Association and Country Vice-President for UK of the International Society of Tropical Foresters. Part 1: Forest Resources and Types. 1. Global Forest Resources - History and Dynamics. 2. Forest Types and Classification. Part 2: Biological and Ecological Processes. 3. Genetics and Speciation in the World's Forests. 4. Structural Dynamics of Forest Stands and Natural Processes. 5. Biological Interactions and Disturbance - Plants and Animals. 6. Biological Interactions and Disturbance - Invertebrates . 9. Models for Pure and Mixed Forests. 10. Forests and the Atmosphere. 11. Environmental Stresses to Forests. Part 4: Social Factors and the Human Interface. 13. Trees in the Urban Environment. 14. The Importance of Social Values. 15. Non-Timber Forest Products and Rural Poverty: An Economic Analysis. 1. History and Impact of Forest Management. Part 1: Sustaining Forest Influences. 2. Forest Reserves, Parks and Wilderness: An Australian Perspective. 3. Forests as Protection from Natural Hazards. 4. Interventions to enhance the conservation of biodiversity. Part 2: Sustainable Wood Production. 5. assessing Potential Sustainable Wood Yield. 6. Silvicultural Treatments to Enhance Productivity. 7. Sustainable Management of Soil and Site. 8. Management of Pest Threats. 9. Management of the Disease Burden. Part 3. Sustaining Social Values and Benefits. 10. Working with Forest Stakeholders. 11. The New Forest Policy and Joint Forest Management in India. 12. Trees in the Urban Environment. Part 4: Case Studies of Sustainable Management. 13. The Structure, Functioning and Management of Old Growth Cedar/Hemlock/Fir Forests on Vancouver Island, British Columbia. 14. The Beech Forests of Haute-Normandie, France. 15. Restructuring of Plantation Forest, Kielder, UK. 16. Sustainable Management of the Mountain Ash Forests in the Central Highlands, Victoria, Australia. 17. Sustainable Management of Malaysian Rain Forest. "The style of the presentation makes it accessible to the average reader with an interest in trees, forests and forestry." 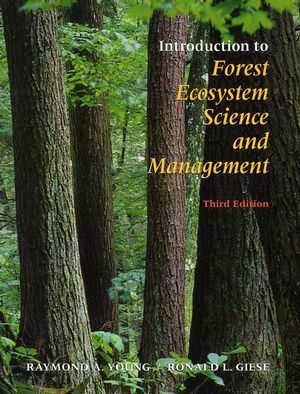 "provide an excellent perspective of modern forest science and are worthy additions to the bookshelf." "It is certainly ambitious; the aim was to sythesise scientific principles and practical knowledge to illuminate the foundations that underly sustainable forest management." 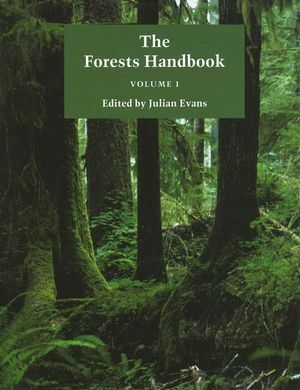 "The Forests Handbook is a comprehensive collection of modern forest science presented in two extensive and informative volumes." "The use of two volumes not only partitions the content into two separate sections, but also makes the books a comfortable size to hold. The quality of presentation is high, with clear, easy to read text and appropriately placed sub-titles." "This is a very modern book encompassing current issues of sustainability, biodiversity and climate change which are paramount factors in today's forest management. It is likely to become a leading text for the twenty-first century encompassing much more than just standard silvicultural practice." 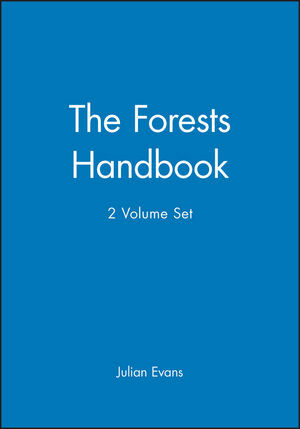 "The two volumes of The Forests Handbook represent a modern compilation of much of forest science. Internationally known authors have written overviews of their subjects." "Written in two handsome volumes by an international team of scientists and practitioners, the Forests Handbook comprehensively overviews the recent advances in forest science in 'scientific journal format'." "a clear, crisp text which answers many of the questions students are likely to have on how forests work and what sustainability means in practice. We'll be buying the two volumes for our library." "To me, and I assume to many forest scientists and forestry academics plus some perservering professionals, the Handbook's main value is in its useful state-of-the-art summaries of several major fields of forest science. It also provides interesting and useful overviews of forest practices in forest types and countries that are not otherwise available. Together, the two volumes could greatly broaden one's understanding and appreciation of the diversity of the world's forests, the knowledge base needed to understand the way they function, and insights into practices that encourage sustainable management in various parts of the world." "Among the plethora of recently published books on forests and forestry this contribution of two substantial volumes must surely rank as one of the most comprehensive and useful to a wide audience. It provides a broad overview of our knowledge of forests and the contribution of this knowledge to wise and sustainable management. Virtually all the senior authors of individual chapters have world reputations in their fields and each chapter would merit an individual review.... Many chapters offer fundamental reading for policy-makers, development specialists and students coming to forestry for the fist time and for professionals and educators needing concise updates of knowledge…A review, even a long one, cannot do justice to the scope and detail of these two volumes but it can give a recommendation of their value and importance to the literature and the story of forestry at a time when the profession is facing considerable challenges."